Fresh madness, straight from the howling bowels of Trader Joe’s Pumpkin Innovation Labs (TJPIL), but oh, what sweet madness this is. Take a quick poll of your friends and co-workers and ask them to name a spice they naturally associate with pumpkin. Ginger? Did they say ginger? Probably not – not unless they’re in the habit of whipping up their own pumpkin pie spice from scratch. Despite the seeming disconnect between pumpkin and ginger, it does make a subtle appearance as a traditional pumpkin pie spice, along side cinnamon, nutmeg and sugar. What it is: Small, pumpkin-ginger ice cream sandwiches. Worth it: Yes. Pumpkin and ginger works, baby! For some reason, the TJPIL decided to pass right by those more likely ice cream companions and go straight for the ginger. And you know what – I’m delighted that they did. Trader Joe’s Mini Ginger Pumpkin Ice Cream Mouthfuls are exactly right – a perfect balance of sweet pumpkin ice cream with a dash of tingling ginger, sandwiched between two soft, ginger cookies. I think we can all agree that it’s hard to screw up an ice cream sandwich as it is. Cookies are great, ice cream is great – putting the two together is pretty much going to be a grand slam. And yet, TJ’s mini ice cream mouthfuls go above and beyond. This seasonal ginger pumpkin variety is a fall addition to their mini ice cream sandwich line, which already includes a mint ice cream version for the summer. All of the varieties show the same attention to creamy delicious detail. Miniaturizing ice cream sandwiches down to finger food form is actually a bit of a brilliant idea. Often times the “worst” part of an ice cream sandwich (“worst” here, in the sense of the “worst” part of winning the lottery, or the “worst” part of all your wildest dreams coming true) are the bits where they cookie is too thick and dry, the ice cream to far away. With these mini ice cream mouthfuls, you never find yourself in such a predicament. Like the inverse of Trader Joe’s Mini Pumpkin Pies, or Chicken Pot Pie Bites, you actually get less crust and more filling. Speaking of that filling – Trader Joe’s uses they’re usual, delicious pumpkin ice cream. If you haven’t had it, rest assured that it tastes far more like sweet and creamy than pumpkiny. On the other hand, there’s plenty of ginger in these frosty bites. If pumpkin puts you off, you might well still enjoy these. If ginger puts you off, however, you’ll probably want to give the a pass. As for me, I couldn’t get enough of these. Each box holds a dozen of the little bites, but I could have eaten twice as many and not been satisfied. Ginger and pumpkin ice cream – who knew they’d work so well together? Would I Buy Them Again: Sure, if I could trust myself around them. Would I Recommend Them: Absolutely, very tasty. 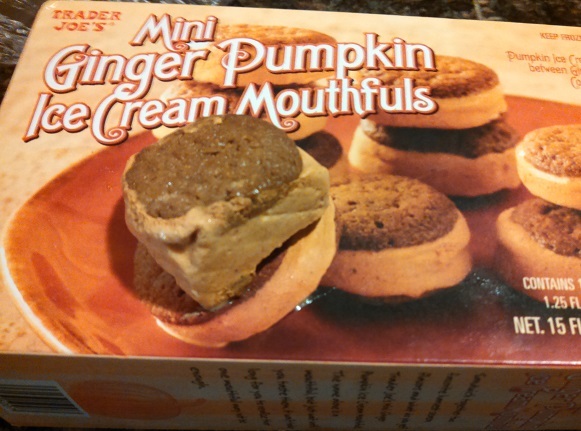 Final Synopsis: Tiny ginger and pumpkin ice cream sandwiches that taste even better than they sound. I would never have known about these if you hadn’t written about them. I ate 6 in one sitting. In my car. At this moment, your blog and I are having a love/hate relationship. Yeah, they’re pretty much irresistible. And now, they are gone. All. Gone. though I like the nutritionals on this product after having several I do believe that the ginger level is a deal killer for me.